This bright and cheerful home provides a full-service kitchen, comfortable living area, a newer washer and dryer, walk-in closet in the master bedroom, and many other newer features, including kitchen appliances and ceiling fans in all rooms. Newer refrigerator (with filtered water and ice) and Keurig K-Cup coffee maker. New carpeting throughout was professionally installed Summer 2014. All linens, including beach towels, are provided. You can walk to the pool, pickleball court and bocce court. Free wireless internet (WiFi) access with password provided at time of occupancy. Wireless printer allows you to print from your iPad, iPhone and laptop. Tenants may use locked/private storage closet that holds beach chairs, cooler, pickle ball racquets and bocce set. A covered parking space is provided. There are flat panel LCD televisions in the living room (Samsung), master bedroom (Samsung) and guest bedroom (Toshiba). There is a blueray DVD player in the living room and DVD players in both bedrooms. TV service includes DVR capability. Naples Heritage Golf and Country Club is one of Naples’ most highly regarded communities. The Naples Heritage community is located on 550 acres of land, including more than 350 acres of preserves, lakes and open spaces, giving Naples Heritage the lowest density of housing of any community of its type in Naples. Naples Heritage is a gated community with a guarded gate 24/7. The championship golf course which opened in 1997 was completely rebuilt in 2015. It plays at over 6,600 yards and has seven sets of tees. The Clubhouse has a main dining room and more casual grill room and bar with TVs. Both the dining room and grill room overlook an outdoor patio and the 9th and 18th holes. The patio also offers outdoor dining and a firepit. 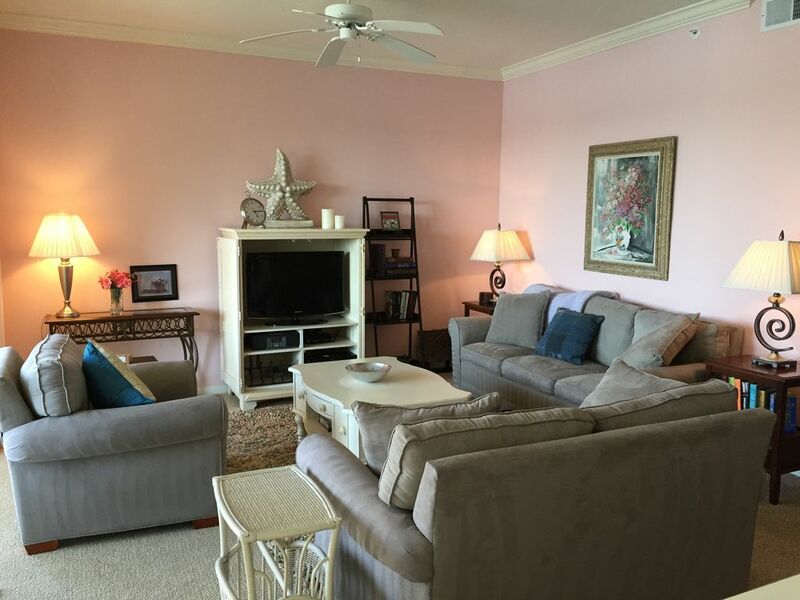 The condominium unit totals 1,362 square feet including the 104 square foot screened lanai. There are two bedrooms and two full bathrooms. The master suite contains its own bathroom, walk-in closet, and smaller second closet. The guest bedroom's bathroom is immediately adjacent to the bedroom. Tenants, on paying a $350 membership transfer fee, will have access to all golf and clubhouse amenities, including golf, driving range, chipping areas, putting greens, pickleball courts, tennis courts, main pool, pro shop and restaurant. This transfer gives guests the same access to golf tee times as the owner. Tee times can be booked either via the automated phone system or the on-line Chelsea system. The fully equipped fitness center is accessible with or without the golf transfer. Naples Heritage enjoys quick access to Naples' Fifth Avenue South shopping and restaurant area as well as the Naples Pier and beaches. The Naples Heritage community is located on Davis Boulevard approximately 5 miles due east of Fifth Avenue South. Turning left out of the front gate onto Davis Boulevard will take you directly to Fifth Avenue South. Naples Heritage is also a short drive from Marco Island and its beaches as well as the Florida Everglades. This is a friendly, welcoming community. We hope you will come and enjoy yourself. Our parents have owned in Naples Heritage since the time the community was developed. We enjoyed our visits so much that we decided to buy here too! We know that you will love the community as much as we do. Full bath with enclosed shower and large vanity. Full bath with combination tub/shower. Bathroom lighting is on dimmer switches. Quiet exhaust fans. Lake view from the lanai, living room, kitchen and office alcove. Laundry detergent is included and found in the laundry area. FREE WiFi access. Access code provided at time of occupancy. Dishwasher pods are included and found under the kitchen sink. Refrigerator with filtered water and ice. Paper goods are provided (paper towels/toilet tissue/tissues). You will locate them in the bathrooms and/or the laundry area. Keurig K-Cup coffee machine, regular coffee maker, toaster, blender also included. Dishwasher pods are included. Library of more than 200 books. More than 30 DVDs available including several family selections. DVDs can be found in living room coffee table drawers. Screened-in lanai with table and 4 chairs, ceiling fan, and electrical outlet. Provides beautiful view of lake and 7th green. Main tennis court access available with transfer of golf and country club amenities. WiFi enabled printer. Print using your iPad, iPhone or laptop. Book library of more than 200 volumes. The Recreation Room located in the Clubhouse also has more than 500 volumes. and style, of the interior decoration tiptop and the level of equipment available to renters well in excess of what would normally be expected. Of equal importance the instructions, travel details, etc. provided by the owner and ease of communication were of the highest order, a big plus. An ideal home from home. This beautiful condo has everything you need. It is a home away from home. It is tastefully decorated, well taken care of and has all the amenities you may want. The owners certainly have your comfort in mind in anticipating any needs, not only HiFi but also a printer and even supplying a spare bulb for the dining room light.You feel safe and secure in a lovely environment with a nice golf course and an excellent restaurant. We thoroughly enjoyed our stay and can recommend it very highly. Thank you, Joe, for all the assistence you gave us all the time. We stayed for a whole month at Naples Heritage from November to December 2014 and found absolutely everything we needed in this amazing condo, this property is so well equipped and the owners have obviously thought about every thing that is needed to ensure a memorable stay. The house was spotless, the linen and towels all good quality, the view from the balcony was lovely, looking over the seventh hole, we saw squirrels, woodpeckers and herons just from sitting on the balcony and observing, heaven...... The facilities were great too, swimming pools, great golf course and driving range, exercise classes and well equipped gym, no excuse not to keep fit staying here ! We also has usage of the owners bikes which was great for cycling around Naples Heritage. We would certainly come back again and thank the owner Joe for all his assistance he gave us whilst we were planning our holiday. Very comfortable, nice ammeneties. Being oldsters it was difficult getting accustiomed to cell phone communication. Would prefer a landline. We appreciate the positive comments. After several years of the land line telephone provider being unable to effectively turn our phone back on after it was put on “seasonal” service, we decided to switch to a cellular service provider to ensure there was reliable phone service for our tenants at all times. In addition, after speaking with several repeat tenants it was determined that the land line received little-to-no use and that they preferred to utilize their own cellular telephones during their stay. Based on this, we made the decision to move from a land line to cellular. This move has also reduced the monthly expenses which help us to keep our rental rates at a steady level and also continue to make improvements to our property. Thank you. Over the past two years, I've spent a number of months at this wonderful Naples Heritage condo. It is beautifully appointed and fully stocked with every item you could possibly require - a warm and cozy retreat! Walk to pool, pickleball courts, and bocce court. Pickleball racquets and bocce set available for your use in the storage closet.